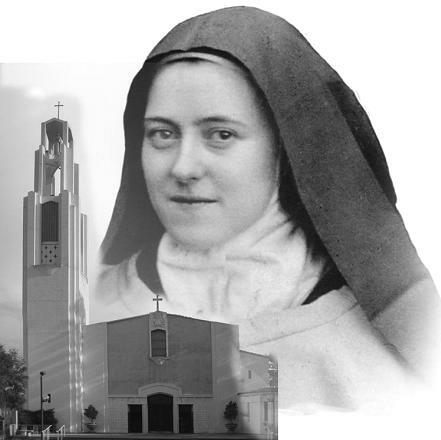 Location of St. Therese Church: In a residential neighborhood at 1100 East Alhambra Road, at the corner of Alhambra Road and El Molino Street, in the City of Alhambra--near the borders of San Gabriel and San Marino, California. We are also approximately three-fourths of a mile from the Cloistered Discalced Carmelite Nuns, and two blocks from both the Missionaries of Charity Contemplative Nuns, and the Sacred Heart Retreat House, which is owned and run by the Carmelite Sisters of the Sacred Heart. The Parish Offices are located at 510 North El Molino Street, just down the street from the church. Buildings in addition to the church that are part of the church campus: Parish Offices at 510 N. Molino St. (two-story building connected to the church); Parish Center at 1106 East Alhambra Road (two-story white building east (to the left) of the church); Parish/School Auditorium (large one-story building in the southeast corner of the parking lot near the green picnic tables); and St. Therese Monastery of the Discalced Carmelite Friars (formerly "the Convent") at 520 North Vega (one block east of El Molino Street).